Did you know I’m writing a cookbook? Yes, it’s happening! Last January I signed with US publisher Gibbs Smith to write a cookbook about citrus fruits. I think I’ve been dreaming of writing a cookbook ever since I picked up a copy of one of Donna Hay’s first books, The New Cook, around 1999. I was a graphic design student back then and her book looked so fresh and bright and beautiful, her food so delicious! Building a career in food for myself had to become my life mission. That was over 15 years ago. Years passed, and slowly but surely I steered towards my goal. There were many years of doing work that was in no way related to food, but there was always food in my life: I started FoodNouveau.com in 2000 as a recipe repository of sorts (there weren’t blogs back then! ), and I cooked and baked day in and day out. 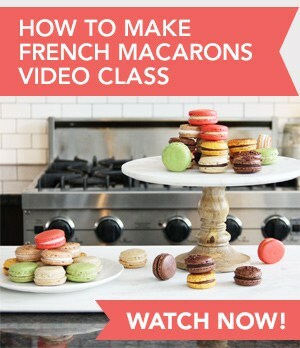 I managed a small cooking school part time, and I rebooted Food Nouveau as a blog in 2010. Since then, my career has truly become all about food: I write about food, develop recipes, and style food photoshoots for a living. Writing this still feels surreal, even after I’ve been doing it for years! It truly is a dream come true for me. The all-consuming dream of writing a cookbook came back to me about two years ago. But how would I get there? The cookbook market was (and still is) overflowing with books written by incredibly talented people. 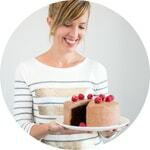 I was just a nobody with a food blog, a handful of clients, and a passion for food. I read a gargantuan number of articles and books about food writing and the publishing industry. I asked my friends who had written books how they’d done it. I hired a coach to help me figure out what my book could be. I met with publishers and agents to pick their brains about the market. All the information and answers I gathered amounted to this: I needed to find my big idea. Because I wasn’t a big-name blogger, I needed to find a new and trendy topic in which I was an expert. And I needed to prove I was the right person to write about it. So I racked my brain and I scratched my head for months. I wanted to find that big idea so hard that I would think about it when I woke up in the middle of the night. I made lists, but every time I thought I had an idea, I discovered someone else had published it. The idea of writing a cookbook slowly lost its shine, and late last year, I decided I would set it aside for a while. I was spending too much time and energy thinking about this; trying to force a book out of myself clearly wasn’t working. I decided I would focus on my recipe development and food career (which was thriving) and set aside that crazy cookbook dream for a few years. No more than a couple of weeks later, a client called me. They wanted to write a whole cookbook and they wanted me to develop the recipes – all 110 of them. Would I be interested in such a project? I couldn’t believe my luck and said YES. I loved the idea of writing a book for an established brand, and of being accompanied through the process. I jumped in with both feet. The day after I said yes, I received an email. Kerry, an editor for Gibbs Smith, had seen my Instagram feed and said she noticed that I seemed to love citrus fruits. She had visited my blog and loved my recipes. They were actively looking for an author to write a book about citrus fruits. Would I be interested in such a project? Reading her email made me dizzy. I looked at her email address, convinced it was spam, or a mass email, or something – this couldn’t be a real opportunity, could it? We exchanged a few emails, and Kerry was indeed a real person and she seemed really nice, too. By an incredible stroke of luck, she was traveling to Quebec City for the holidays. We met over coffee, we chatted, and we hit it off. 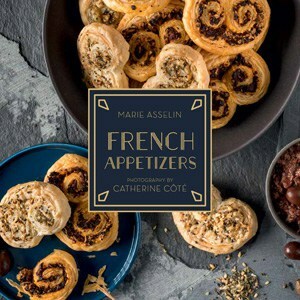 The subject was so perfect for me–I’ve been cooking and baking with citrus fruits for years, they’re my absolute favorite ingredients to work with!–that I still can’t understand why I didn’t think of this book myself. Anyway, shortly after my meeting with the editor, I signed a contract, and here I am today, able to say I’m writing a cookbook. For real! I can’t divulge all details yet, but I can tell you that the book will feature easy savory and sweet recipes that put citrus fruits front and center of the plate. Not just a drizzle of juice or a grating of zest here and there. Rather, these are full-on, bright, citrus-forward recipes that prove that lemons, limes, oranges, and their cousins can play a bigger role than a supporting one. The book will be published in the spring of 2018. Make sure to subscribe to my newsletter if you want me to keep you in the loop about all book-related news and events. 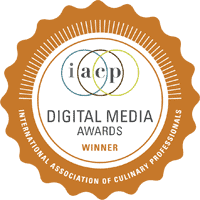 Edit: I received so many recipe tester applications, THANK YOU! I’m closing the form and will get back to everyone who applied very soon. The timeline of my citrus fruit cookbook is very tight. 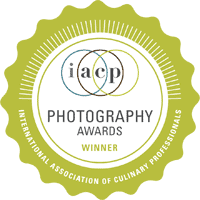 I will be handing in my recipes for edits late May, and the photography of the dishes will be done in June. Between my recipe submission and the photoshoot, I need people who are willing to cook or bake some of my dishes. I want to make sure my recipes are easy, appealing, and delicious. I will select 5 to 8 recipe testers from among the submissions. I’d love to send recipes to everyone, but because of the short timeline, I need to keep this process to a manageable level! Interested in testing recipes for my upcoming citrus cookbook? Fill in this short form! 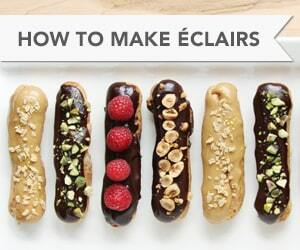 Look for a reply late next week (around May 5) to know whether you’ve been selected to be a recipe tester. Every recipe tester will receive a selection of carefully selected citrus-themed treats and gifts (after their testing work is done in June 2017), and a signed copy of the book after it comes out (in the spring of 2018). Such as this aromatic Passion Fruit and Lemon Drizzle Cake, this elegant Cara Cara Orange and Maple Panna Cotta, this family-friendly Superfast Sesame Orange Beef Stir-Fry… and the delicious Grapefruit, Fennel, and Parmesan Salad I’m sharing today. During the recipe testing process, I tasted ALL the citrus fruits that came my way and experimented with many flavor combinations. Some of them have come as a revelation! 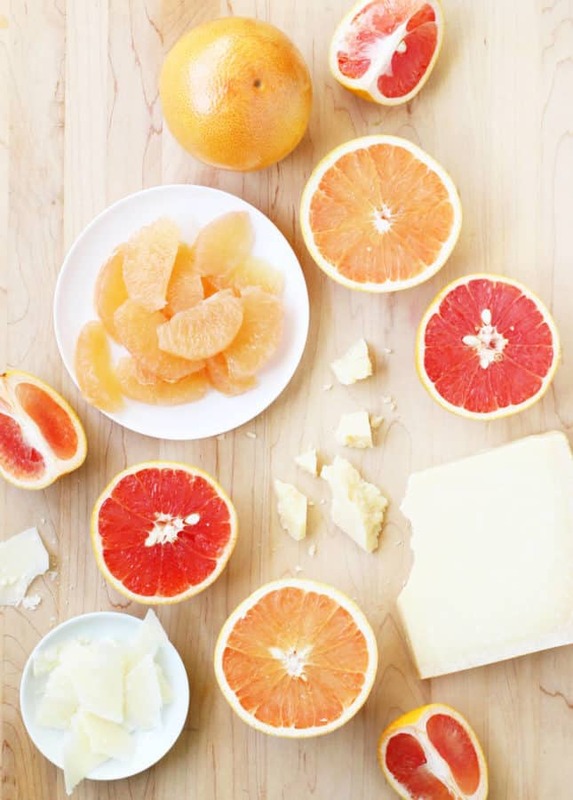 The pairing of grapefruit and parmesan may sound unusual, but it makes perfect sense when you taste it. This recipe was inspired by a classic Sicilian salad that usually features blood oranges instead of grapefruit. I wanted to find a way to serve this salad year-round (blood oranges are only available in winter), so I was trying to find a suitable substitute. 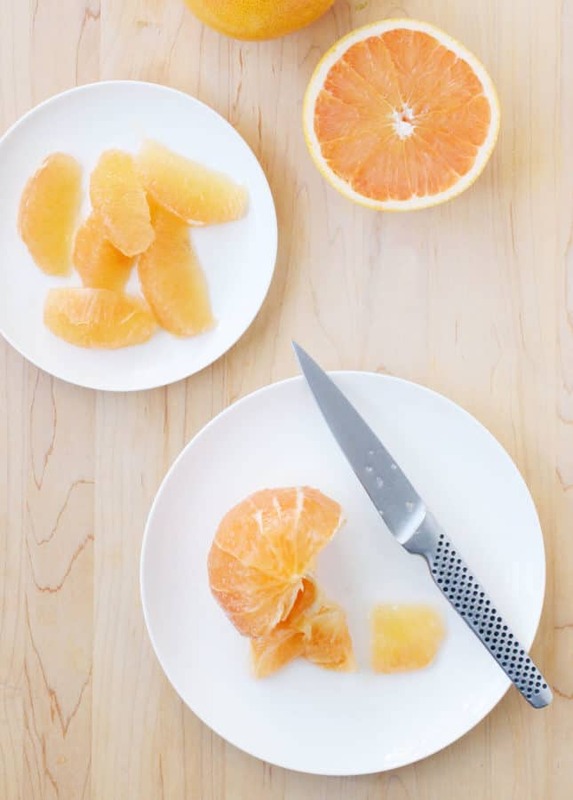 Regular oranges are slightly less acidic than blood oranges, and would make the salad too sweet. I thought of grapefruit, which I thought would kick the salad’s interest levels way high. Boy, was I right! This salad would wake up the drowsiest taste buds. The combination of zesty grapefruit, mellow parmesan, and crunchy fennel is simply irresistible. I like to add greens to the salad to make it more substantial, and you can play with different types, depending on whether you want to add a subtle or more assertive flavor to the dish. Mâche, pea shoots, and baby spinach play a mellow supporting role, whereas watercress and arugula add a peppery, slightly bitter taste that works really well with grapefruit. 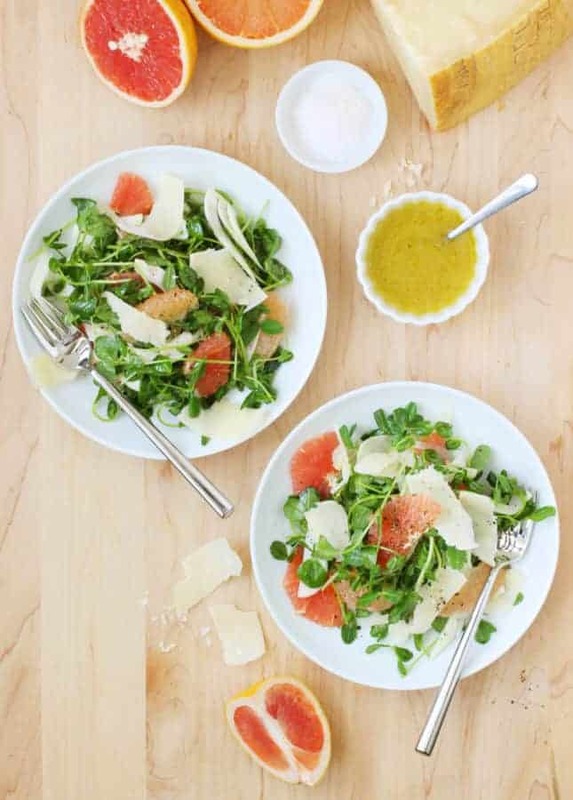 Quick ingredient note: To make the very best version of this salad, make sure to use freshly shaved, aged Parmigiano-Reggiano cheese (as opposed to pre-grated parmesan cheese). “Parmigiano-Reggiano” is a protected designation of origin and you can recognize the cheese by its beige-yellow stamped edge. The cheese has a distinct nutty flavor and a dry, brittle texture dotted with salty, crunchy bits. Once you taste authentic Parmigiano-Reggiano, you can’t go without it! It’s a bit pricey, but it keeps for a long time well-wrapped in the fridge. Plus, with such a flavorful cheese, a little goes a long way! 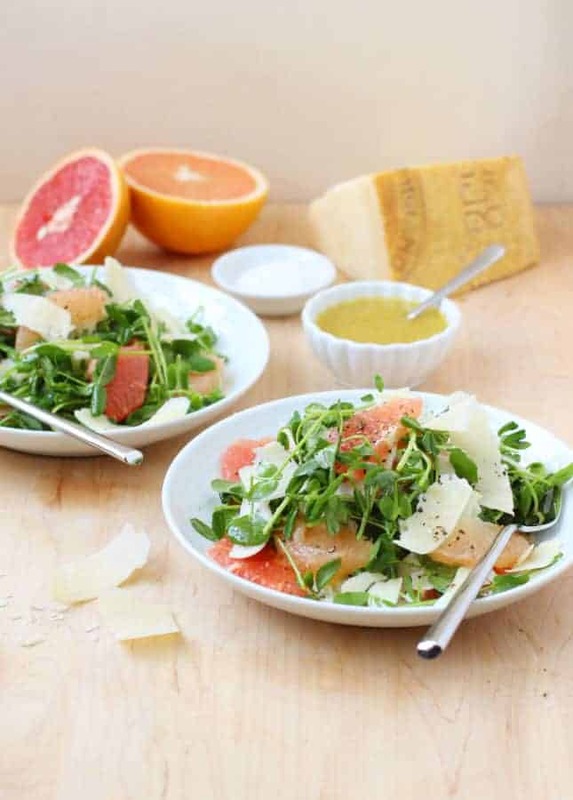 A simple dish like this Grapefruit, Fennel, and Parmesan salad is the perfect way to showcase a quality ingredient like Parmigiano-Reggiano. 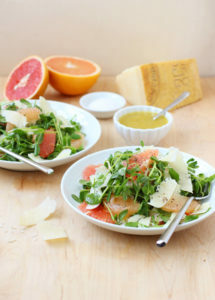 Inspired by a classic Sicilian salad, this colorful Grapefruit, Fennel, and Parmesan Salad is the perfect combination of bright, mellow, sour, and salty. Cut the foliage off from the fennel bulb and discard. Halve the bulb, then cut out the tougher stem from the center of each fennel bulb half. Very thinly slice the fennel and transfer to a large salad bowl. 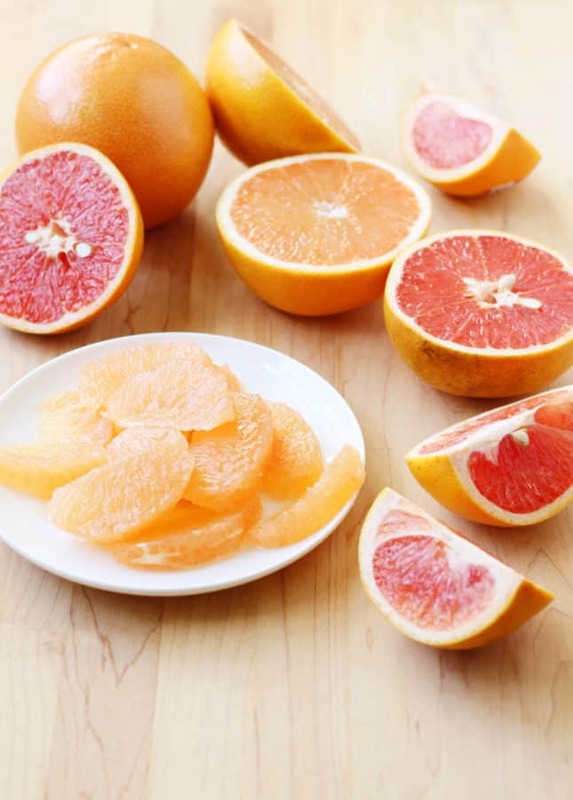 Segment the grapefruits. Using your hand, squeeze the leftover membrane above a small bowl to gather grapefruit juice. Reserve for the dressing. 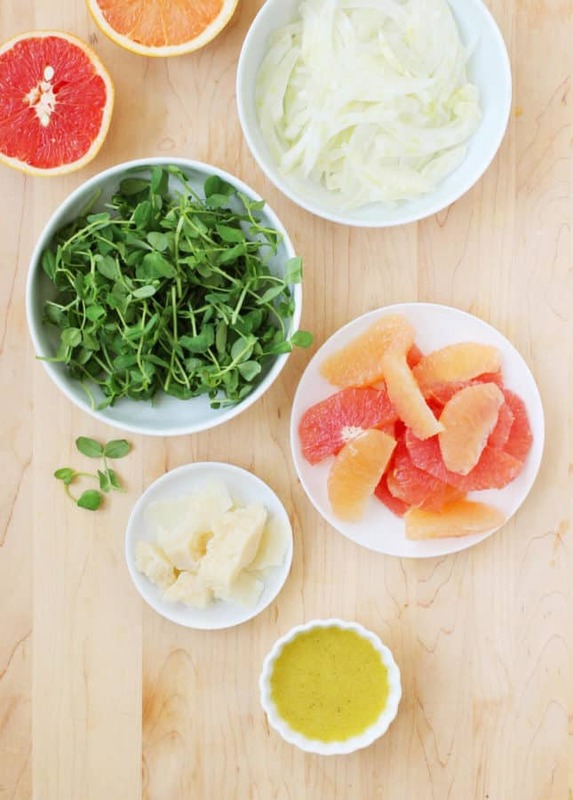 Transfer the grapefruit segments to the salad bowl. Add the greens. Make the dressing: In a screw-top jar, add all the dressing ingredients. Close the jar and shake vigorously. Drizzle about 3 tbsp (45 ml) of the dressing over the salad. Gently toss the salad to coat. Season with flaky sea salt or fleur de sel and ground black pepper. Add more dressing if needed. Serve immediately. The book sounds great! Wish I had time to help with the testing. One small note, I don’t think you want to use the word “notoriety” up there in regards to food bloggers. That’s famous for something bad, disreputable, like Al Capone. Maybe you “renown” is more what you’re after? Feel free to delete this if you don’t agree! congratulations on the book deal! This salad looks amazing, and perfectly summery. I’m looking forward to trying it out.